Because an acquired neurologic injury (such as a stroke) affects both sensory and motor function, walking can be severely affected. Sensory changes, weakness, and spasticity affect movement strategies, which alter a person’s ability to successfully respond to losses of balance. A stroke affects how much and how often a person walks and also affects walking adaptability—the ability to adapt to different conditions during ambulation—as well as endurance. Gait training generally starts as soon as possible following a stroke, using manual techniques, task-specific training, strengthening, and, when available, body weight-assisted treadmill training and robotic devices. An example of over-ground gait training. A movement strategy or synergy is a flexible, repeatable pattern of movement that can be quickly and automatically accessed by the central nervous system. Movement strategies allow us to store and reuse patterns of movement that have been successful in the past. Strategies are efficient, automatic movement patterns that evolve over time. Each time a loss of balance threatens, the nervous system draws on these pre-programmed movement strategies to ensure the maintenance of balance.Movement strategies used by the nervous system to respond to perturbations are diminished following a stroke. The ankle strategy is used in response to small perturbations is also called ankle sway. Source: Lauren Robertson. The ankle strategy—also called ankle sway—is used in response to small perturbations or losses of balance. When a small loss of balance occurs—as when standing on a moving bus—the foot acts as a lever to maintain balance by making continuous automatic adjustments to the movement of the bus. When a small balance adjustment is needed, muscles close to the floor (anterior tibialis and gastrocnemius) activate first and flow upward in a distal to proximal pattern. When a perturbation is too large to be successfully handled by the ankle strategy, the hip strategy is needed. When the hip strategyis used, movement is centered about the hip and ankle muscles (anterior tibialis and gastrocnemius) are almost silent. The muscles in the trunk activate first as activation flows downward to the legs in a proximal to distal pattern. So, if the bus stops suddenly and the body bends forward, the low back and hamstrings will contract in that order to return the body to upright. If the perturbation is strong and your center of gravity moves well past your base of support, it is necessary to take a forward or backward step to regain balance. This is referred to as a stepping strategy. Studies have shown age-related changes in stepping in older adults. Compared to younger people, older adults initiate the stepping strategy in response to smaller losses of balance and tend to take several small steps rather than one larger step (Maki & McIlroy, 2006). Arm movements have a considerable role in balance control and are part of the strategies discussed above. The upper limbs start to react at the very beginning of a disruption of balance and continue to be active as the body attempts to regain control. By automatically reaching and grasping for support, the arms perform a protective function. In the case of a small perturbation, upper limb movements can prevent a fall by shifting the center of gravity away from the imbalance. When upper extremity paresis or spasticity is present, post stroke subjects exhibit poor protective reactions during a perturbation of balance. They demonstrate a deficit in anticipatory and reactive postural adjustments. These impairments of the affected upper limbs limit a person’s ability to recover from perturbations during functional tasks such as walking (Arya et al., 2014). Even in the absence of a neurologic disorder, age-related changes affect upper extremity reaction time when balance is disrupted. Older adults reach for support surfaces more readily than younger adults but the reach-reaction time is slower. Increased tendency to reach for support and a slowing of these reactions have been found to be predictive of falling in daily activities (Maki & McIlroy, 2006). Think for a moment that you are cooking dinner and accidentally touch a scalding hot fry pan. You feel the heat and withdraw instantaneously. You aren’t thinking “I better take my hand off the hot pan before it burns me”—your reflexes take care of that for you. The withdrawal is almost instantaneous because your nervous system senses danger and reflexively withdraws. This type of reaction is used in movement strategies; they are slower than reflexes but faster than volitional movement. They are fast enough to help us respond to losses of balance without having to think. This type of movement requires thought and is relatively slow compared to reflexive and automatic movement. Using our brains to think about movement isn’t very practical when we need something done really fast—by the time your brain warns you to bend your waist, step forward, or grab onto something when the bus stops abruptly, it’s already too late to regain balance. Stand up next to your chair. Make sure you are standing on a flat, firm surface. Now close your eyes. Notice that your body sways a little—you are using the ankle strategy to stay balanced. Notice also that after a short amount of time you sway less—that means your nervous system is adjusting. Often, following a stroke, a person looses the ability to use the ankle strategy. This can have a profound impact on balance. Stand up again. Ask someone to give you a little nudge from behind. Try not to take a step. If it was a truly small nudge you will likely bend at the waist to try to regain your balance. This is an example of the hip strategy. Now ask your partner to give you a slightly bigger nudge from behind. If the nudge is big enough you’ll have to take a step. This is the stepping strategy. We use these strategies automatically, all day long, without effort. Someone who has had a stroke can’t access these strategies as quickly as you can. If faced with a nudge from a passerby, or a bus starting/stopping, or a walk on uneven ground, the inability to adjust quickly may result in a fall. Regaining the ability to walk following a stroke is of paramount importance to patients and caregivers alike; improving balance and walking leads to greater independence and improves general well-being. In the first week following a stroke, only one-third of patients are able to walk without assistance. In the following weeks, walking ability generally improves. At 3 weeks, or at hospital discharge, more than half of stroke survivors can walk unaided. By 6 months, more than 80% are able to walk independently without physical assistance from another person (Balasubramanian et al., 2014). Following a stroke, walking can take a lot of energy; impaired muscle function, weakness, and poor cardiovascular conditioning can double the amount of energy expended. The high energy cost of walking can affect a person’s ability to participate in daily activities and lead to a vicious cycle where physical activity is avoided. For example, in one study, stroke patients walked 50% of the daily amount of matched sedentary adults and used 75% of their VO2 peak for walking at a submaximal rate (Danielsson et al., 2011). Walking may improve more rapidly when patients are involved in setting specific goals. The results of several motor learning studies in which the person’s attention was focused on the outcome of an action rather than the action itself produced more effective performance than focusing on the quality of the movement (Carr & Shepherd, 2011). In the hospital, an early goal for walking might be to walk to the next appointment, or to walk at least part of the way, rather than being transported in a wheelchair. Each day the patient should be encouraged to select a distance to walk independently and safely. Initially, this may be only a few steps. The goal is to walk the chosen distance a certain number of times a day, increasing distance as soon as possible, and keeping a record of progress, which gives the patient a specific focus (Carr & Shepherd, 2011). Walking is greatly dependent upon our ability to adapt to varying environmental conditions and tasks. Walking from the bedroom to the bathroom with a walker requires a different level of attention and adaptability than walking across a busy street carrying a bag of groceries. Even walking and talking can be a challenge for post stroke patients. Over time, up to 85% of individuals with a stroke regain independent walking ability, but at discharge from inpatient rehab only about 7% can manage steps and inclines or walk the speeds and distances required to walk competently in the community. Limited ability to adjust to changes in the task and environment means a person either avoids walking in complex situations (a safety strategy) or has a heightened risk of falls when required to walk under these challenging conditions (Balasubramanian et al., 2014). Despite its importance, assessment of walking adaptability has received relatively little attention. Frequently used assessments of walking ability after stroke involve walking short distances (such as the Timed Up and Go test) and examination of isolated limb movements (such as the Fugl-Meyer Assessment). Although valuable, these assessments do not take into account the skills needed to re-engage in safe and independent ambulation in the home and community. Comprehensive assessments and specific interventions are needed to improve walking adaptability (Balasubramanian et al., 2014). In addition to the ability to adapt to different conditions and tasks, walking adaptability has two other requirements: (1) stepping, and (2) postural control (Shumway-Cook & Woollocott, 2012). Stepping involves the ability to generate and maintain a rhythmic, alternating gait pattern as well as the ability to start and stop. Postural control involves both the musculoskeletal and nervous systems. Generate the basic stepping pattern of rhythmic reciprocal limb movements while supporting the body against gravity and propelling it forward. Maintain control of posture (equilibrium) to keep the center of mass over a constantly moving base of support and maintain the body upright in space. Adapt to environmental circumstance or changes in the behavioral goal (Balasubramanian et al., 2014). Source: Balasubramanian et al., 2014. These components are especially necessary for complex tasks. For example, walking adaptability is crucial on uneven ground or cluttered terrains and when the task requires walking and turning or negotiating a curved path. There are endless combinations of task goals and environmental circumstances that must be considered to comprehensively capture walking adaptability (Balasubramanian et al., 2014). It is evident that many patients are discharged from inpatient rehabilitation severely deconditioned, meaning that their energy levels are too low for active participation in daily life. Physicians, therapists, and nursing staff responsible for rehabilitation practice should address this issue not only during inpatient rehabilitation but also after discharge by promoting and supporting community-based exercise opportunities. During inpatient rehabilitation, group sessions should be frequent and need to include specific aerobic training. Physical therapy must take advantage of the training aids available, including exercise equipment such as treadmills, and of new developments in computerized feedback systems, robotics, and electromechanical trainers. Although many people affected by stroke have regained some ability to walk by the time they are discharged from rehab, many have low endurance, which limits their ability to perform household tasks or even to walk short distances. After a stroke, walking requires a much higher level of energy expenditure, and upon discharge many stroke patients are not necessarily functionalwalkers (Carr & Sheperd, 2011). Functional walking is assessed using tests of speed, distance, and time. Minimal criteria for successful community walking include an independent walking velocity of 0.8 m/s or greater (about 2.6 feet/second), the ability to negotiate uneven terrain and curbs, and the physical endurance to walk 500 meters or more. In a review of 109 people discharged from physical therapy, only 7% achieved the minimum level. Cardiorespiratory fitness training can address both the efficiency with which people affected by stroke can walk and the distance they are able to achieve (Carr & Sheperd, 2011). The loss of independent ambulation outdoors has been identified as one of the most debilitating consequences of stroke. Among stroke survivors 1 year after stroke, the most striking area of difficulty was low endurance measured by the distance walked in a 6-minute walk test. Those subjects able to complete this test were able to walk on average only 250 meters (820 feet) compared to the age-predicted distance of >600 meters (almost 2,000 feet), equivalent to 40% of their predicted ability and not far enough for a reasonable and active lifestyle. The detrimental effect of low exercise capacity and muscle endurance on functional mobility and on resistance to fatigue is likely to increase after discharge if follow-up physical activity and exercise programs are not available (Carr & Sheperd, 2011). In 2002 the American Thoracic Society (ATS) published guidelines for the 6-minute walk test with the objective of standardizing the protocol to encourage its further application and to allow direct comparisons among different studies and populations. The American Thoracic Society guidelines include test indications and contraindications, safety measures, and a step-by-step protocol as well as assistance with clinical interpretation (Dunn et al., 2015). Key components of the protocol include the test location, walkway length, measurements, and instructions. According to the American Thoracic Society protocol, the test should be performed on a flat, enclosed (indoor) walkway 30 m (just under 100 feet) in length. This protocol requires 180° turns at either end of the walkway and additional space for turning. The guidelines advise that shorter walkway lengths require more directional changes and can reduce the distances achieved. The influence of directional changes may be amplified in the stroke population, who characteristically have impaired balance, asymmetric gait patterns, and altered responses for turn preparation. Conversely, reducing the number of directional changes may increase the distance achieved (Dunn et al., 2015). Body weight-supported treadmill training (BWSTT) is an increasingly being used to encourage early walking following a stroke. It is a rehabilitation technique in which patients walk on a treadmill with their body weight partly supported. Body weight-supported treadmill training augments walking by enabling repetitive practice of gait (Takeuchi & Izumi, 2013). In patients who have experienced a stroke, partial unloading of the lower extremities by the body weight-support system results in straighter trunk and knee alignment during the loading phase of walking. It can also improve swing1 asymmetry, stride length, and walking speed, and allows a patient to practice nearly normal gait patterns and avoid developing compensatory walking habits, such as hip hiking and circumduction2 (Takeuchi & Izumi, 2013). 1Swing phase of gait: during walking, the swing phase begins as the toe lifts of the ground, continues as the knee bends and the leg moves forward, and ends when the heel come in contact with the ground. 2Circumduction: a gait abnormality in which the leg is swung around and forward in a semi-circle. The hip is often hiked up to create enough room for the leg to swing forward. Locomotor Training Program (LTP). Source: Duncan et al., 2007. Another example of a body-weight supported treadmill. Source: NIH, 2011. Treadmill walking allows for independent and semi-supervised practice, for those with more ability, as well as improving aerobic capacity and increasing walking speed and endurance. The very early practice of assisted over-ground and harness-supported treadmill walking is probably critical to good post-discharge functional capacity in terms of both performance and energy levels (Carr & Shepherd, 2011). The Locomotor Experience Applied Post Stroke (LEAPS) trial—the largest stroke rehabilitation study ever conducted in the United States—set out to compare the effectiveness of the body weight-supported treadmill training with walking practice. Participants started at two different stages—two months post stroke (early locomotor training) and six months post stroke (late locomotor training). The locomotor training was also compared to a home exercise program managed by a physical therapist, which was aimed at enhancing flexibility, range of motion, strength, and balance as a way to improve walking. The primary measure was improvement in walking at 1 year after the stroke (NINDS, 2011). In the LEAPS trial, stroke patients who had physical therapy at home improved their ability to walk just as well as those who were treated in a training program that requires the use of a body weight-supported treadmill device followed by walking practice. The study, funded by the NIH, also found that patients continued to improve up to 1 year after stroke—defying conventional wisdom that recovery occurs early and tops out at 6 months. In fact, even patients who started rehabilitation as late as 6 months after stroke were able to improve their walking (NINDS, 2011). Source: Diaz et al., 2011. Many robotic systems have been developed aiming to automate and improve body weight-assisted treadmill trainers as a means for reducing therapist labor. Usually these systems are based on exoskeleton type robots in combination with a treadmill. One such system—the Lokomat—consists of a robotic gait orthosis and an advanced body weight-support system, combined with a treadmill. It uses computer-controlled motors (drives) that are integrated in the gait orthosis at each hip and knee joint. The drives are precisely synchronized with the speed of the treadmill to ensure a precise match between the speed of the gait orthosis and the treadmill (Díaz et al., 2011). The LokoHelp gait trainer “Pedago.” Source: Diaz et al., 2011. The LokoHelp is another device developed for improving gait after brain injury. The LokoHelp is placed in the middle of the treadmill surface, parallel to the walking direction and fixed to the front of the treadmill with a simple clamp. It also provides a body weight-support system. Clinical trials have shown that the system improves the gait ability of the patient in the same way as the manual locomotor training; however, the LokoHelp required less therapeutic assistance and thus therapist discomfort is reduced. This fact is a general conclusion for almost all robotic systems to date (Díaz et al., 2011). Over-ground gait trainers consist of robots that assist the patient in walking over ground. These trainers allow patients to move under their own control rather than moving them through predetermined movement patterns. The KineAssist is one robotic device used for gait and balance training. It consists of a custom-designed torso and pelvis harness attached to a mobile robotic base. The robot is controlled according to the forces detected from the subject by the load cells located in the pelvic harness (Díaz et al., 2011). ReWalk is a wearable, motorized quasi-robotic suit that can be used for therapeutic activities. ReWalk uses a light, wearable brace support suit that integrates motors at the joints, rechargeable batteries, an array of sensors, and a computer-based control system. Upper-body movements of the user are detected and used to initiate and maintain walking processes (Díaz et al., 2011). The capacity of robots to deliver high-intensity and repeatable training make them potentially valuable tools to provide high-quality treatment at a lower cost and effort. These systems can also be used at home to allow patients to perform therapies independently, not replacing the therapist but supporting the therapy program. However, despite the attractiveness of robotic devices, clinical studies still show little evidence for the superior effectiveness of robotic therapy compared to current therapy practices, although robotics have been shown to reduce therapist effort, time, and costs (Díaz et al., 2011). Under therapist supervision, Greg Myers uses a treadmill device that places him in a standing position as robotics assist his legs to walk on a treadmill. Sensors continuously monitor walking patterns, changing power and speed according to Myers’s mobility. According to the Centers for Disease Control and Prevention, someone in the United States has a stroke every 40 seconds. Someone dies from a stroke every 4 minutes. It is a leading cause of long-term disability. A stroke occurs when there is a disruption in blood flow to the brain. The most common kind of stroke, ischemic stroke, occurs when a clot or mass obstructs a blood vessel. A hemorrhagic stroke occurs when a weakened blood vessel ruptures. This article follows the treatment of stroke survivor Greg Myers, who was finishing his workday when he suddenly became confused and had difficulty walking and talking. A co-worker called Emergency Medical Services, and Myers was transported to the nearest acute care primary stroke center for treatment. Myers had suffered a right cerebellar hemorrhage. His hospital course was complicated by the need for evacuation of the hematoma, post-occipital craniotomy, and wound dehiscence. After several days of acute medical care and monitoring, it was determined that Myers would benefit from intensive multidisciplinary rehabilitation services to address his residual physical deficits and cognitive needs. To begin his stroke rehabilitation journey, Myers chose HealthSouth Harmarville Rehabilitation Hospital (which will be known as Encompass Health Rehabilitation Hospital of Harmarville beginning January 1, 2019). Since 2002, HealthSouth Harmarville has been certified as a Joint Commission Disease-Specific Care Stroke Program. The team follows evidence-based Clinical Practice Guidelines (CPG) for treatment of individuals with stroke. By following these guidelines, the team has confidence that treatments are based upon the most current evidence-based research and philosophies. Comprehensive rehabilitation services, such as those provided at HealthSouth Harmarville, are found to be one of the most effective ways to achieve functional recovery and independence after a stroke. Intensive rehabilitation services facilitates neuroplasticity and recovery of motor function. Neuroplasticity is the ability for the brain to “rewire” or adapt to new circumstances by reorganizing synaptic connections. By engaging in therapy that is challenging, repetitive, and task specific, motor pathways that have been disrupted by the stroke can be rewired and strengthened. One of the goals of the clinical practice guidelines is to reduce the complications of stroke. One of the most frequent complications following a stroke is difficulty swallowing, or dysphagia. Stroke survivors with dysphagia have an increased risk of pneumonia, dehydration, and malnutrition. Instrumental assessment in the form of a Modified Barium Swallow study (MBS) or Fiber-Optic Endoscopic Evaluation of Swallowing (FEES) determine an appropriate, safe diet and the course of treatment. Swallowing difficulty is treated by exercise, diet modification, and technology, such as neuromuscular electrical stimulation. Early therapy intervention is also important to maximize motor recovery in our stroke patients. Deconditioning and non-use are a hurdle to restoring function, especially with the elderly stroke population. Physiological changes and complications as a result of prolonged bedrest can lead to additional loss of muscle mass, contractures, skin breakdown, and deep vein thrombosis, all of which further hinder the stroke-recovery process. Being able to walk again is a common goal shared by most stroke survivors, and Myers was no exception. Studies show that stroke affects mobility in greater than half of stroke survivors. Those suffering from gait disturbances often have further difficulties with balance and cardiovascular endurance, and are subsequently more likely to fall. Therefore, improvements achieved with gait function frequently carry over to improvements in many other aspects of daily living. In the past decade, technology has moved to the forefront of therapeutic intervention as an adjunct to conventional practice. This is true for all disciplines and ranges from Vital Stimulation in the treatment of dysphagia to robotics in the treatment of movement disorders. Body weight-supported technology is one such area of technological advancement being utilized for gait training. 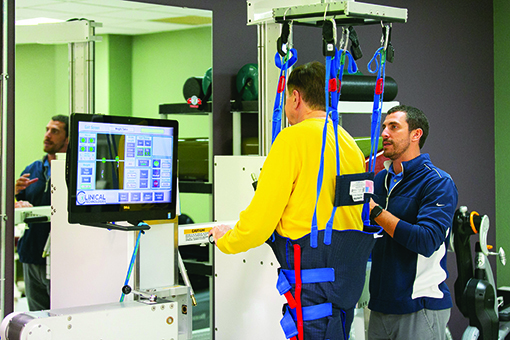 Partial body weight (PBW)-supported devices are designed to use a harness and/or suspension system to assist with standing and safety during ambulation. When partial body weight devices are used over a treadmill, the therapist is able to change gait speed and work on gait quality under controlled, safe conditions. However, many PBW devices do not require use of a treadmill and can be used over the ground while providing similar training benefits to patients. Automated technology incorporates the use of robotics, using attachments to the patient’s hip, knees, and ankles. These robotics guide the patient’s lower-extremity movement and promote normal movement throughout the entire gait cycle. Robotic body weight support is generally used with more involved patients who have significant difficulty with lower extremity movement. These devices allow the therapist to gradually decrease the support provided as gait improves. Balance deficits resulting from a stroke can also be very debilitating and frustrating for individuals. Since Myers had a stroke that affected the cerebellar part of his brain, balance training was also a major component of his therapy program. Myers’s balance program included a variety of approaches including altering visual feedback and multi-surface challenges. Equipment utilized for balance deficits can be as simple as carpet or foam. More complex devices are designed to use interactive technology and visual feedback to further analyze a patient’s posture and balance deficits. Treadmills are another piece of technology commonly found in the clinic that are used to improve motor recovery after stroke. Treadmill training can be used with or without partial body weight support. When used along with conventional therapy, treadmill training has been shown to improve gait quality and efficiency, strength, and cardiovascular fitness. Other adjunct modalities are also utilized by physical therapists to address aerobic fitness and reciprocal movements of the lower extremities, such as stepper machines, elliptical trainers, and stationary/recumbent bikes. Advanced technology used for the treatment of upper extremity dysfunction has also impacted stroke rehabilitation. Improving deficits in fine motor control, coordination, and weakness are often a focus of treatment in stroke recovery. Electrical stimulation, biofeedback, or robotics are utilized in many technologies to retrain arm movements and hand function. Some of these devices are even coupled with gaming to provide motivation and entertainment for the patient while exercising. Family/caregiver involvement early on is very beneficial to a successful inpatient rehabilitation stay and transition to home. Our Clinical Practice Guidelines recommend that patients and caregivers be educated throughout the entire stay to learn about disease process, expected outcomes, treatment goals, and follow-up support services available in the home and community. As part of our discharge planning and preparation for a safe transition home, we completed a home visit for Myers. This is when the physical and occupational therapist team takes the patient home in order to problem-solve accessibility issues and to perform caregiver training in their own environment. By doing this, Myers and his wife were less anxious and fearful about their transition home. Quality inpatient rehabilitation is a vital step in the journey of returning to community participation. Many patients choose to receive home health services after inpatient rehabilitation to assist with the transition to home. Myers briefly utilized home health before initiating the next stage of his recovery, which was a neuro-focused outpatient program found at HealthSouth Harmarville. Outpatient therapy provides an opportunity for stroke survivors to build endurance and to practice skills in higher levels of difficulty. Concerns and issues that have arisen from community integration can be incorporated into treatment and resolved. Instrumental activities of daily living are also a focus of the outpatient program. Participation in activities such as disease-specific support groups and wellness programs can help to facilitate return to the community. HealthSouth Harmarville offers the entire continuum of care for patients, ranging from inpatient rehabilitation to home health to outpatient services to community support groups. Myers’s wife, Cathy, has become an active participant in the hospital’s Stroke Support Group, attending the educational programs and interacting with families of other stroke survivors. Myers, himself, continues to make gains in physical functioning, daily living skills, communication, and cognitive skills in outpatient therapy. He has returned to some of the leisure activities he enjoyed before his stroke. The couple took another step toward normalcy by going on a vacation to Aruba in August. Meri K. Slaugenhaupt, MPT, has served on the HealthSouth Harmarville Rehabilitation Hospital team since 1993, beginning as a physical therapist and now serves as the team’s program champion of the stroke program. In this role, Slaugenhaupt has obtained Stroke Joint Commission Disease Specific Certification, making HealthSouth Harmarville the first rehabilitation hospital to achieve this status in 2002. Under Slaugenhaupt’s leadership the hospital has achieved its 8th Joint Commission disease-specific care certification in 2017 for the stroke program. She earned her bachelor’s degree in physiology with a minor in exercise science from Penn State University in 1991. She then earned her master’s in physical therapy at the University of Pittsburgh. Valerie Bucek, MA, CCC-SLP/L, has been a member of the HealthSouth Harmarville Rehabilitation Hospital team for more than 25 years. She began her work there as a staff speech pathologist and a speech therapy supervisor prior to her current role as the hospital’s therapy manager. Bucek received a bachelor’s degree in speech pathology from Duquesne University and a master’s degree in communication disorders from the University of Pittsburgh. She is one of the leaders of the hospital’s stroke and Parkinson’s disease programs, is founder and facilitator of the HealthSouth Harmarville Community Stroke Support Group, and is an affiliate for the ASHA Special Interest Division-Adult Neurogenic Communication Disorders. For more information, contactRehabEditor@medqor.com. IRVINE, Calif., Jan. 15, 2019 /PRNewswire/ — Since the beginning, virtual reality paired with an omnidirectional treadmill that allows users to move through the virtual world in any direction has been relegated to realms of fiction…until now. A new company, OmniPad, (OmniPad.com), is looking to change the world of virtual reality with its sleek and innovative game-changing VR treadmill that allows for fully immersive natural 360-degree movement through virtual space. OmniPad has launched a SEC regulation crowdfunding equity campaign, (https://wefunder.com/omnipad.company ), to share awareness and the potential capabilities of this awe-inspiring product. You can check out the company’s YouTube channel, (https://www.youtube.com/channel/UCsR1sCPunIZs2G28DFmmn9A), to see the OmniPad in action. IMAGE: PARTICIPANT WALKING ON C-MILL WITH RESEARCH SCIENTIST AT KESSLER FOUNDATION. Mobility deficits due to disease, trauma, or aging, adversely affect a person’s quality of life. Specifically, the inability to adjust one’s gait to one’s environment – such as to maneuver a doorstep, puddle of water or other obstacles – leads to increased risk of falling. Using a VR-based device called C-Mill, investigators at Kessler Foundation are exploring interventions to improve disabling deficits in individuals with multiple sclerosis, spinal cord injury, and stroke. The C-Mill is a state-of-the-art treadmill that trains the user in obstacle avoidance and influences gait pattern by projecting virtual cues on a safe walking surface. Research is funded by the National Institute on Disability, Independent Living & Rehabilitation Research, National Institutes of Health, Department of Defense, Reeve Foundation, New Jersey Commission on Spinal Cord Injury Research, Craig H. Neilsen Foundation, and Children’s Specialized Hospital. VR is no longer only for gaming or enjoyment. An American company called Blue Goji is using VR to improve one’s health by making exercise more fun. Kyra Constam said there generally is a learning curve for VR. The first time users feel lost, but “the more you do it, the more you get used to it,” she said. After carefully studying the users’ experiences, Blue Goji plans to begin selling the Infinity treadmill to the public in 2019. VOA’s Elizabeth Lee reported on this story from Texas. Xiaotong Zhou adapted her report for Learning English. George Grow was the editor. Functional electrical stimulation (FES) is important in gait rehabilitation for patients with dropfoot. Since there are time-varying velocities during FES-assisted walking, it is difficult to achieve a good movement performance during walking. To account for the time-varying walking velocities, seven poststroke subjects were recruited and fuzzy logic control and a linear model were applied in FES-assisted walking to enable intensity- and duration-adaptive stimulation (IDAS) for poststroke subjects with dropfoot. 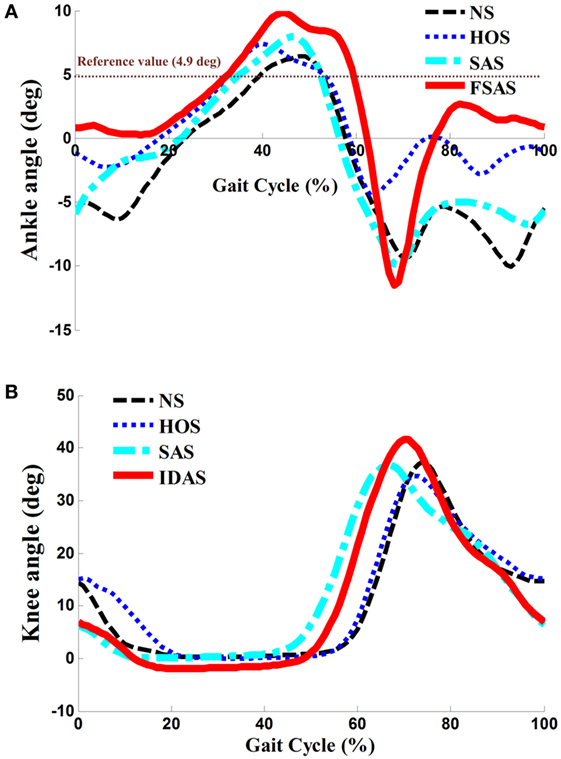 In this study, the performance of IDAS was evaluated using kinematic data, and was compared with the performance under no stimulation (NS), FES-assisted walking triggered by heel-off stimulation (HOS), and speed-adaptive stimulation. A larger maximum ankle dorsiflexion angle in the IDAS condition than those in other conditions was observed. The ankle plantar flexion angle in the IDAS condition was similar to that of normal walking. Improvement in the maximum ankle dorsiflexion and plantar flexion angles in the IDAS condition could be attributed to having the appropriate stimulation intensity and duration. In summary, the intensity- and duration-adaptive controller can attain better movement performance and may have great potential in future clinical applications. Stroke is a leading cause of disability in the lower limb, such as dropfoot (1). A typical cause of dropfoot is muscle weakness, which results in a limited ability to lift the foot voluntarily and an increased risk of falls (2–4). Great effort is made toward the recovery of walking ability for poststroke patients with dropfoot, such as ankle–foot orthoses (5), physical therapy (6), and rehabilitation robot (7). Functional electrical stimulation (FES) is a representative intervention to correct dropfoot and to generate foot lift during walking (8, 9). The electrical pulses were implemented via a pair of electrodes to activate the tibialis anterior (TA) muscle and to increase the ankle dorsiflexion angle. The footswitch or manual switch was used to time the FES-assisted hemiplegic walking in previous studies, while they were only based on open-loop architectures. The output parameters of the FES required repeated manual re-setting and could not achieve an adaptive adjustment during walking (10, 11). Some researchers have found that the maximum ankle dorsiflexion angle by using FES with a certain stimulation intensity had individual differences due to the varying muscle tone and residual voluntary muscle activity and varied during gait cycles (12, 13). If the stimulation intensity was set to a constant value during the whole gait cycle, the result could be that the muscle fatigues rapidly (14). Another important problem was that the FES using fixed stimulation duration from the heel-off event to the heel-strike event would affect the ankle plantar flexion angle (15, 16). Closed-loop control was an effective way to adjust the stimulation parameters automatically, and several control techniques have been proposed (17, 18). Negård et al. applied a PI controller to regulate the stimulation intensity and obtain the optimal ankle dorsiflexion angle during the swing phase (19). A similar controller was also used in Benedict et al.’s study, and the controller was tested in simulation experiments (20). Cho et al. used a brain–computer interface to detect a patient’s motion imagery in real time and used this information to control the output of the FES (21). Laursen et al. used the electromechanical gait trainer Lokomat combined with FES to correct the foot drop problems for patients, and there were significant improvements in the maximum ankle dorsiflexion angles compared to the pre-training evaluations (22). There were also several studies that used trajectory tracking control to regulate the output and regulate the pulse width and pulse amplitude of the stimulation (23). The module was based on an adaptive fuzzy terminal sliding mode control and fuzzy logic control (FLC) to determine the stimulation output and force the ankle joint to track the reference trajectories. In their study, FES applied to TA was triggered before the heel-off event. Because the TA activation has been proven to occur after the heel-off event and the duration of the TA activation changed with the walking speed (24, 25), a time interval should be implemented after the heel-off event (26). In Thomas et al.’s study, the ankle angle trajectory of the paretic foot was modulated by an iterative learning control method to achieve the desired foot pitch angles (27). The non-linear relationship between the FES settings and the ankle angle influenced the responses of the ankle motion (28). FLC represents a promising technology to handle the non-linearity and uncertainty without the need for a mathematical model of the plant, which has been widely used in robotic control (29). Ibrahim et al. used FLC to regulate the stimulation intensity of the FES (30), and the same control was used on the regulation of the stimulation duration to obtain a maximum knee extension angle in Watanabe et al.’s study (31). However, most closed-loop controls adjust only one stimulation parameter, and few FES controls considered both varying the stimulation intensity and duration while accounting for the changing walking velocities. Figure 4. (A) Ankle angles during the gait cycle for one poststroke subject at free speed; (B) knee angles during the gait cycle for the same poststroke subject at free speed. To date, rehabilitation robotics has come a long way effectively aiding the rehabilitation process of the patients suffering from paraplegia or hemiplegia due to spinal cord injury (SCI) or stroke respectively, through partial or even full functional recovery of the affected limb. The increased therapeutic outcome primarily results from a combination of increased patient independence and as well as reduced physical burden on the therapist. Especially for the case of gait rehabilitation following SCI or stroke, the rehab robots have the potential to significantly increase the independence of the patient during the rehabilitation process without the patient’s safety being compromised. An intensive gait-oriented rehabilitation therapy is often effective irrespective of the type of rehabilitation paradigm. However, eventually overground gait training, in comparison with body-weight supported treadmill training (BWSTT), has the potential of higher therapeutic outcome due its associated biomechanics being very close to that of the natural gait. Recognizing the apparent superiority of the overground gait training paradigms, a through literature survey on all the major overground robotic gait rehabilitation approaches was carried out and is presented in this paper. The survey includes an in-depth comparative study amongst these robotic approaches in terms of gait rehabilitation efficacy. More than just a treadmill…It is the most important improvement to gait training since the parallel bars. The Biodex Gait Trainer™ 3 is more than a treadmill. It is designed with an instrumented deck that issues both audio and visual real-time biofeedback to prompt patients into their correct gait pattern. Step length, step speed and right-to-left time distribution (step symmetry) are directly addressed; patient footfall is compared to desired footfall step after step, both on the display in real time and documented in an easy to read histogram. The Biodex Gait Trainer is quiet, non-intimidating and allows the therapist to get in there and treat their patients. Real goals are monitored and progress reported. Objective documentation, with comparison to age- and gender-based normative data, helps prove need and document outcomes to family, referring physicians and insurance providers. The Biodex Gait Trainer 3, with or without the Unweighing System or FreeStep for BWSTT, is suitable for all rehabilitation pathologies. Biodex has recently published Body Weight Support Treadmill Training (BWSTT) with Transition to Over Ground Ambulation: A Clinical Guideline for the Treatment of Patients with Neurological Conditions using Biodex Unweighing System and Gait Trainer. The document classifies the neurologically involved patient, then steps the user through the various phases of recovery for profound,moderate and minimal neurological impairments. Treadmill Plus… The Gait Trainer 3 also serves as a traditional treadmill, with all the features and benefits of the Biodex RTM600 Rehabilitation Treadmill.